The PS82 range miniature vacuum switch is based on our proven PS41 series pressure switch format and are designed for demanding applications where space and/or price are strong concerns. 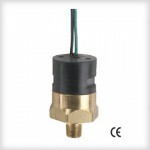 Vacuum switches actuate in the event of a pressurised container being compromised, and are commonly found in fluidic and liquid processing systems. Our extensive range of vacuum switches includes a variety of single pole double throw (SPDT) switches, as well as single pole single throw vacuum switches. The selection you see here has been designed and chosen for their functionality, quality and safety, offering exceptional performance at excellent value. If you cannot find the component you need, please contact us. We are happy to adapt existing product to meet your specific engineering requirements, or alternatively, custom-manufacture the part you need.